Detecting the early signs of diseases is an important step toward offering early treatment and management to prevent symptoms from worsening. Ophthalmologists have the opportunity to help protect patients’ health with the use of digital retinal imaging, which offers more detailed views of the retina and a better chance of detecting certain diseases. The use of high-resolution retinal imaging can lead to early detection of the following diseases and provide visual evidence of the changes that occur in patients’ eyes over time due to these conditions. Retinal imaging can reveal signs and symptoms of glaucoma, such as damage to the optic nerve caused by excess pressure or increased pressure on blood vessels in this area. Since this eye disease can lead to permanent vision loss, early detection is crucial. As one of the main causes of vision loss in patients 50 years of age and older, spotting the early warning signs of age-related macular degeneration is important. Retinal imaging can show signs of this disease, including fluid leakage or bleeding in the rear part of the eye. Retinal detachment is a medical emergency that requires prompt treatment to prevent permanent vision loss. When you use digital retinal imaging on patients who are exhibiting symptoms of this condition, such as seeing flashes of light or floaters, you can quickly find evidence that the retina has become detached. 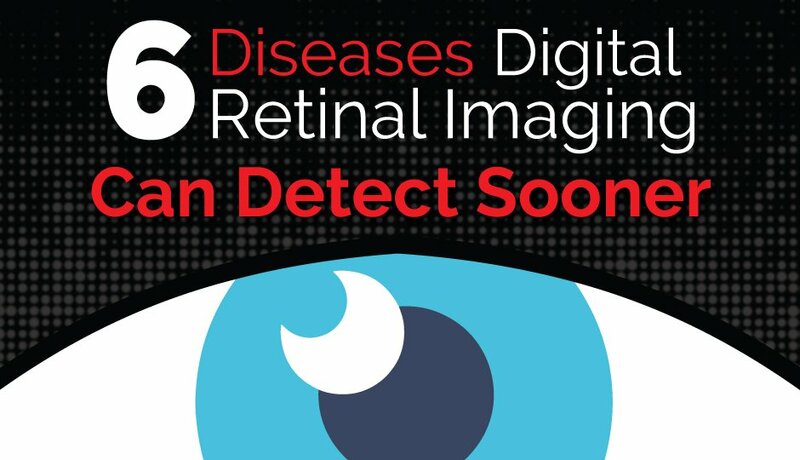 The use of retinal imaging on patients with diabetes helps detect early signs of damage to the retina due to this disease. This technology provides detailed images of the retina, which allows ophthalmologists to check for abnormal changes, such as the formation of new blood vessels or leakage in this part of the eye. Retinal imaging might also show swelling, another common sign of this disease. High blood pressure, or hypertension, can go undiagnosed and untreated for months or years, increasing the risk of heart problems or stroke. With digital retinal imaging, patients can find out early that they have high blood pressure. This type of imaging shows symptoms of high blood pressure that affect the eyes, such as blood vessels becoming narrower, bleeding in the rear part of the eye or retinal spots. Finding signs of this disease early helps ensure that patients get the treatment they need to manage it and decrease the risk of complications. Retinal imaging can significantly increase patients’ chances of successfully treating certain types of cancer. High-resolution images of the retina can reveal early signs of cancer in the eye, such as dark spots that indicate a melanoma. When these symptoms are noticed early, patients can undergo diagnostic testing and seek treatment promptly to prevent cancer from spreading to other parts of the body. The longer it takes to find and diagnose signs of cancer, the more difficult it becomes to treat, especially if it enters the bloodstream. For more information on digital retinal imaging for your practice, please contact Coburn Technologies today.